While many were disappointed by the new Fantastic Four movie, including the director himself, let’s look back to a simpler time before comic book films had become the huge tentpoles they are today. 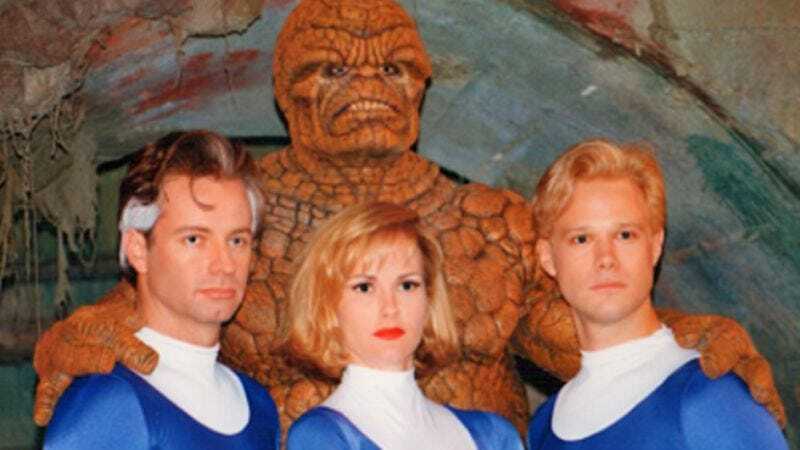 In 1994, in order to retain the rights to the property, producer Roger Corman was commissioned to make a Fantastic Four film—with no intent of it ever being released. Many remember seeing trailers for the film in front of flicks like Carnosaur 2 and even posters in their theaters, but it was never meant to be seen. However, copies escaped into the wild and showed up at comic conventions and other wretched hives of scum and villainy across the world. And now, thanks to Your Geek News, it has shown up online for people to watch (at least until it’s pulled down by some nefarious legal team, possibly of Latverian descent). The film, directed by Oley Sassone, is a more classic retelling of the origin story of Marvel’s first family, complete with costumes with a giant “4” on them and a Doctor Doom design that appears to have stepped directly from the comic book pages. The budget was very low, something that’s understandable considering it wasn’t meant to be released but was just meant as a sign that the producers were working on the property. A lot of the effects aren’t very special, but they do carry a lot of low-budget charm with them—especially The Thing’s suit and the CGI Human Torch that looks like a cut extra from a Lawnmower Man sequel. There’s a documentary out about the whole affair, called Doomed! The Untold Story Of Roger Corman’s Fantastic Four that speaks with many people involved in the production. But see what all the hubbub is about firsthand by watching the entire 90 minute movie below. Was the first outing the best or are audiences cursed to never get a good Fantastic Four film?